On the eve of Super Bowl LIII, a solitary mural to Colin Kaepernick is no more. 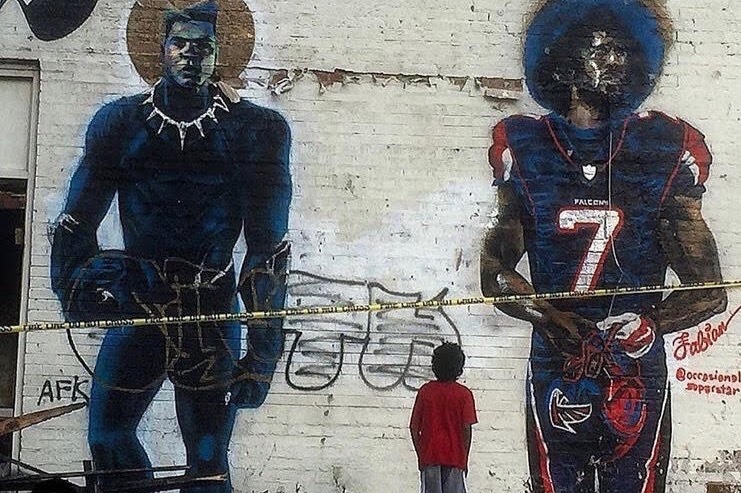 Artist Fabian Williams, who painted the mural of Kaepernick standing next to Muhammad Ali on the side of an abandoned building on the corner of Fair Street and Joseph E. Lowery Boulevard, said the building was torn down this week. Kaepernick, a former quarterback for the San Francisco 49ers, launched a protest movement in 2016 when he began kneeling during the playing of the national anthem to protest police brutality toward black men. Several players followed Kaepernick’s lead, which even got the attention of President Trump. Kaepernick hasn’t played in the league since 2017 and there’s a pending National Football League Players Association lawsuit against the league, alleging that team owners, influenced by President Donald Trump, conspired against him. On Sept. 1, 2016, Colin Kaepernick knelt down on a football field to send a silent message. Kaepernick said, he was protesting the treatment of people of color in the U.S., particularly a spate of police shootings of unarmed black men. When Kaepernick wasn’t able to get a job, Williams painted the quarterback in an Atlanta Falcons uniform. “I thought Atlanta, because of our civil rights history, would be a perfect place for him,” Williams said. Williams, who sometimes paints under the name, “Occasional Superstar,” has painted murals and projects all over the city. He was driving through Atlanta one day when he was struck by the space, which is right across the street from the Morehouse College basketball arena and about a mile from Mercedes-Benz Stadium. The building, that for two years housed a mural of Colin Kaepernick, was demolished this week on the even of Super Bowl LIII. The wall had been used as a space to promote advertisements for albums, parties and movies. Williams never sought permission to paint on the wall and met the building’s owner once. The owner of the building could not be reached. About six months ago, a fire ravaged the building, but the wall remained intact. Williams had planned on spending all day Saturday touching up the mural in time for the Super Bowl. Fabian Williams latest mural, “Where Dreams are Made,” is on the side of the Westside Cultural Arts Center in Midtown. Meanwhile, Williams is moving on. He painted another Kaepernick mural on a wall on Peeples Street. And he just completed a mural commissioned by Nike, “Where Dreams are Made,” on the side of the Westside Cultural Arts Center in Midtown.